This Banko Yaki earthenware rice cooking pot makes fluffy, glistening rice and is great for making plain rice, Takikomi gohan, variety of vegetable dishes and Miso soup. Gas cook top and oven safe. First, wash rice thoroughly and then put into the pot. Use the lines inside the pot as a guideline for the amount of water. Cooking time on a gas cook top: Cover over medium-high heat for 9-15 minutes, and then turn off heat. With the heat off, let rice continue to steam for 10 to 20 minutes. DO NOT lift the lid during this time. After the rice has cooked, remove the lid to allow any remaining steam to escape. Fluff up the rice thoroughly with wooden shamoji or plastic spatula. Carefully fluff up without smashing down rice. 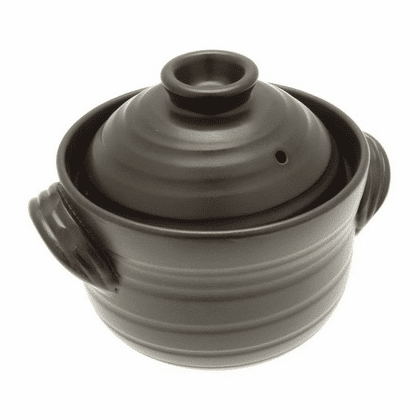 2 gou size pot, 7-7/8 inches long (20 centimeters long), 6-1/2 inches in diameter (16.5 centimeters in diameter) 6-1/4 inches tall (16 centimeters tall), $69.95 item #190803. 4 gou size pot, 10-7/8 inches long (27.5 centimeters long), 8-7/8 inches in diameter (22.5 centimeters in diameter) 8-1/4 inches tall (21 centimeters tall), $105.95 item #190804.